INDIANAPOLIS, IN – Naomi E. (Watson) Tobin, 88, passed away on Thursday, January 31, 2019 at St. Vincent Hospice in Indianapolis following an extended illness. She was born on October 5, 1930 in Westfield the last of 12 children to Carl and Eva Lena (Purdy) Watson and was a former Alexandria resident, where she had been a member of the Alexandria Friends Church. She had worked at Winona Hospital formerly of Indianapolis and was a Certified Home Health Aid. Naomi had training from Union Bible College in Christian Education and Pastoral Ministry. Naomi was proud of her 25 plus year membership in the Alexandria TOPS. She attained KOPS status and maintained that for several years. 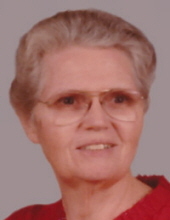 She enjoyed gospel music and traveled near and far to hear her favorite groups. She is survived by 27 nieces and nephews, several great nieces and nephews and several great-great nieces and nephews. She was preceded in death by her parents, her husband 20 years-Ralph Tobin in 1974, her son Edgar Tobin in 1994, brothers-Burl Watson, John Watson, James Watson, Jesse Watson and Joseph Watson, sisters-Clarice Simmons, Marjorie Waller, Mary Gray and Martha Odgen. Services honoring Naomi’s life, legacy and faith will take place at 4 pm on Sunday, February 3, 2019 in the Owens Funeral Home, 412 North Harrison Street, Alexandria. Rev. Mike Watson will officiate. Private interment services will take place on Monday in Park View Cemetery in Alexandria. Friends may call at the Owens Funeral Home after 3 pm on Sunday prior to the services. Memorial contributions are suggested to The Gideons with envelopes available at the funeral home. Owens Funeral Home is honored to care for Naomi and serve the Tobin/Watson family. To send flowers or a remembrance gift to the family of Naomi E. (Watson) Tobin, please visit our Tribute Store. "Email Address" would like to share the life celebration of Naomi E. (Watson) Tobin. Click on the "link" to go to share a favorite memory or leave a condolence message for the family.